Hundreds gathered to pay their respects to one of Cleveland's own. 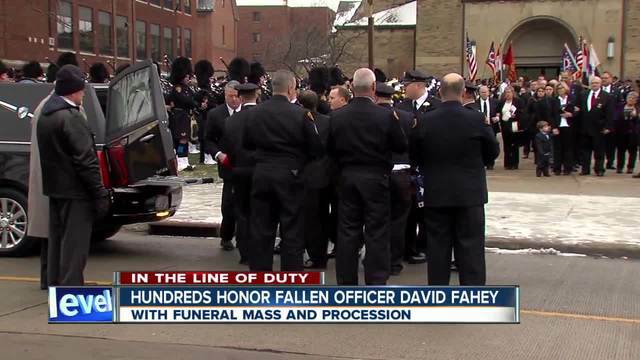 Officers from surrounding districts and the public stood for hours to give their final farewell to fallen Cleveland officer David Fahey, who was killed in a hit-skip on Tuesday morning during early morning rush hour while he was setting out flares for an earlier crash on Interstate 90. 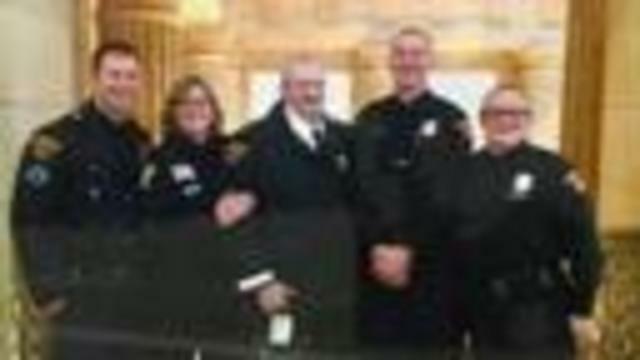 Fahey, 39, was hired on July 1, 2014, and assigned to the first district. He was a Navy veteran and an avid Cleveland sports fan. Police said the officer was hit by a white Toyota Camry that took off after the crash. The vehicle was found on East 31st Street in Lorain about 9:30 a.m.
Israel Alvarez, 44, was arrested and charged with aggravated vehicular homicide and felony hit-skip. A procession carried his body from the Our Lady of Angels Church and made a final ride past First District Headquarters before arriving at Brooklyn Heights Cemetery. His fellow officers saluted their friend and fellow partner in blue. Mourners saluted the fallen officer and tied blue ribbons around telephone poles and handrails to show solidarity with Fahey's family and the Cleveland Police Department. Others carried signs and saluted Fahey as the hearse with his body made its way through the procession. Relatives of Fahey recognized the support that has poured in since Tuesday and also expressed the difficult days ahead in a family statement. Losing David so suddenly was an enormous shock for our family and one that we've yet to fully process. While this is a terribly difficult time, we all take solace in the fact that we have had so much support, both from the community and David's law enforcement family. David was a man who was all about his family. He loved spending time with his many nephews and 'Uncle Dave' will be greatly missed. David loved the City of Cleveland and was a huge fan of Cleveland sports. He also loved all things surrounding technology and took great pride in his Irish heritage. David was a proud Veteran of the United States Navy and, above all, loved being a Cleveland Police Officer. Although the coming days, weeks and months will be extremely difficult, we want to take the time to thank the community for this great outpouring of support. The sincere prayers are appreciated and the emotion attached to each and every one is palpable. It is with great pride that we can say that David will be forever honored, fondly remembered and dearly missed.